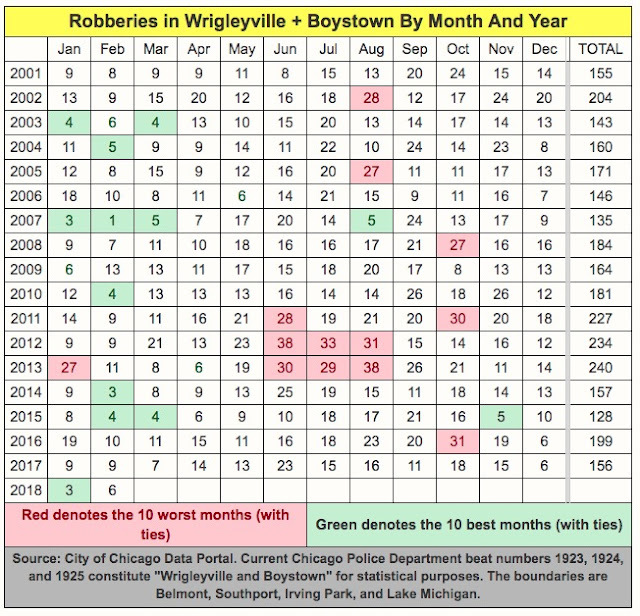 Two robberies have been reported in Wrigleyville and Boystown since Thursday, but there is some very good news to report on the two neighborhoods as well. The three-month period ending February 28 recorded the fewest robbery cases in W & B of any December-February period since at least the year 2000. Only 15 hold-ups were reported during the latest three-month period, a remarkable turn-around from the terrible years of 2011, 2012, and 2013 when the area held the distinction of being the worst neighborhood for robberies in the entire city. Fifteen robberies over a three-month period compare quite nicely to 2013 when Wrigleyville and Boystown had 27 muggings in January alone. See CWB’s comprehensive, 18-year chart of monthly robbery reports below. If the opening days of March are any indication of what lies ahead, Wrigleyville and Boystown will struggle to out-perform last year’s tally of just seven muggings during the month. • Around 1:30 a.m. on Thursday, a man reported that an offender pushed him to the ground and robbed him in the 3400 block of North Halsted in Boystown. In a detail that is sure to leave many victim-blamers saying “I told ya so,” the man admitted that he was talking on his phone and had been drinking at the time of the attack. He described the offender as a black man in dark clothing who stands about 6’5” tall and weighs about 240 pounds. • A Wrigleyville man was robbed at gunpoint in the 3900 block of North Clark on Saturday evening. The man reported that two offenders approached him outside of a home around 5:30 p.m. and announced a robbery. After getting the man’s money, both men fled southbound on Clark. They are described as two short, Hispanic men in their mid-20’s. One wore a blue hoodie and the other wore a red hoodie, the victim said. • Slightly outside of the Wrigleyville and Boystown zone, a woman reported that a man cut her purse from her shoulder with a knife behind the Bagel Restaurant, 3107 North Broadway, last Wednesday evening. The woman was in a parking lot when the offender slashed her Michael Kors purse from her shoulder and ran away. She described the offender as a black man in his late teens who stands about 6-feet tall. He was wearing a dark jacket, hoodie, and blue jeans. Cops found the woman’s emptied purse nearby in the 500 block of West Briar.